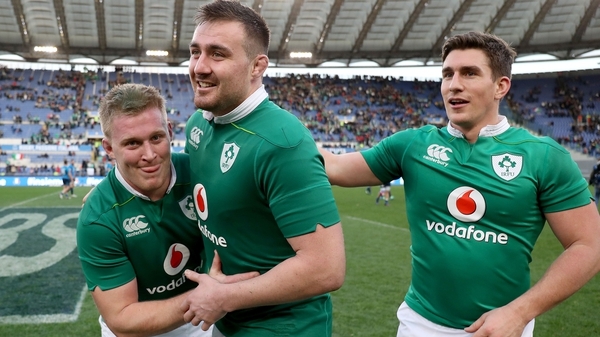 CJ Stander and substitute Craig Gilroy both claimed hat-tricks as Ireland bounced back from last weekend's Six Nations defeat to Scotland with a nine-try 63-10 thrashing of Italy in Rome. The foundations for the win were laid in the opening 40 minutes, when in sharp contrast to the sloppy start in Murrayfield seven days previous, Joe Schmidt’s side hit the ground running and claimed the try bonus-point by the 35th minute. A brace each from Stander and Keith Earls saw the visitors hold a 28-10 lead at the interval, while the second 40 minutes saw Ireland add four more tries, with Ireland rarely in danger against a listless Italian side. The Azzurri were porous in defence and failed to really test Ireland’s defensive structure that had looked so vulnerable in Murrayfield as Conor O’Shea’s side suffered a deflating second successive home defeat of the tournament. Captain Rory Best was ruled out before kick-off, but the returning Cian Healy and debutant Niall Scannell began with real intent when Ireland pushed their opponents off the ball in the first scrum of the game after just three minutes. It was one-way traffic from the off at the Stadio Olimpico with Ireland enjoying dominance in the scrum and set-piece, the Italian defence was under the cosh and coughed up a number of penalties close to their own line. Simon Zebo was prominent throughout the opening stages and looked like he might have given Ireland the lead in the 10th minute when the ball was swept out to the left wing, but the Munster man was caught by Angelo Esposito and lost control just as he had swivelled to ground the ball. The first try of the game came just a minute later when numbers finally told as Keith Earls claimed his 21st international try. The visitors kept up the pressure close to the line before Paddy Jackson’s skip pass found Earls hugging the right wing, with the out-half adding the extras. The home side replied within minutes with a penalty from Carlo Canna, but the Irish response was swift, and not surprising considering they enjoyed 89pc possession in the opening 20 minutes. Robbie Henshaw, Cian Healy and Jamie Heaslip made big carries and Zebo skipped out two team-mates to find Munster team-mate CJ Stander on the left wing and there was no stopping the South-African born flanker from there. Jackson was again unerring from the tee with the touchline conversion, which took an unusual trajectory, but sailed between the posts. It was relentless power and pace from Ireland and Zebo lurked with menace every time he got his hands on the ball. Fellow winger Earls availed of a three-on-two situation on the right wing and the clock hadn’t even reached 30 minutes and Schmidt’s side found themselves just one try short of a bonus point. Italy's first meaningful spell of possession resulted in maximum reward as their ambition was rewarded in a penalty-try. Captain on the day Jamie Heaslip was penalised for collapsing the maul and rather than take the shot at goals, Canna kicked to touch. From the resulting lineout, Sergio Parisse claimed and with the rolling maul rumbling forward, referee Glen Jackson deemed that Ireland had illegally halted the move. A penalty try was awarded and Donnacha Ryan was sin-binned much to the delight of the sizeable home support. 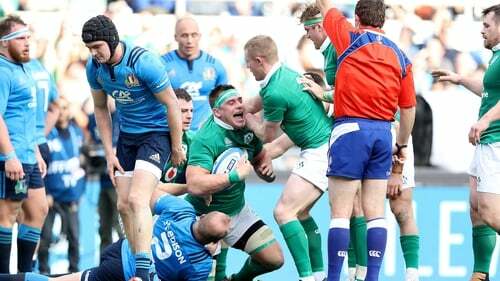 The resurgence was short-lived however as Ireland made light of the numerical disadvantage. CJ Stander once again demonstrated his ball-carrying prowess to power over the line from close range to secure the try bonus-point with five minutes to go before the break. Jackson continued his impeccable place-kicking to stretch the lead to half-time lead to 18 point, with the Italians facing a mountain to climb. The majority in Rome hoped for an early Italian score in the second half to breathe life into the contest, but it was Ireland who stretched their advantage. Earls and Murray combined well to make big inroads into Italian territory. Stander was fed the ball and with the line in sight, he again shook off the would-be challengers to propel over the line for his hat-trick, the first Irish forward to claim such an accolade in the Six Nations. The Italians tried to muster an opening, but poor execution and at times, poor control, saw Ireland soak up a couple of passages of play as the pace of the game dropped from the frantic first-half exchanges. A raft of substitutions on both sides – James Tracey, Jack McGrath, John Ryan, Ultan Dillane and Craig Gilroy were all on the field with a little under 20 minutes remaining – contributed to the change in tempo as Ireland looked comfortable throughout. One of those introduced claimed the sixth and it was a combination of individual effort and generous defending from the Italians. Gilroy looked a threat as soon as he was introduced for Henshaw, but there appeared to be little danger when he took a Heaslip pass on the Italian 22. The Ulster man however jinked inside and left the covering defence for dead to race in under the posts to add to the home side’s misery. The seventh followed a similar patter, this time Garry Ringrose blitzing the cover defence to get his second international try. A clever disguised pass from Jackson saw the Leinster centre run back towards traffic, before cutting a line away from Italian defenders as Parisse and company couldn’t get a hand on the 22-year-old, with Jackson again slotting over the simple conversion. Gilroy soon after added a second. Man-of-the-match Stander engineered the turnover and the Ulster man again showed his electric speed to rub salt in the wounds for the home side. In injury-time Gilroy also claimed a hat-trick as a ruthless Ireland refused to take their foot off the gas and claim a 53-point winning margin. Next up for Ireland will be an altogether tougher assignment at home to France in a fortnight, while Italy will have plenty to work on before their daunting visit to Twickenham.